Give your army something to fight for! Every army needs buildings – for command, for defense, for anti-missile measures. These are the standard structures for the North American Combine. The Command Post provides coordination between the front and the regional headquarters. The Hardened Command Post fills the same role in areas where a break-through is expected. Laser Turrets and Towers provide extreme range cover, and the ultimate in defense from Cruise Missiles. Radars and Jamscreens are usually just targets in the scenario, but can be given specific functions in play. The Combine structures were sculpted by Phil Miller. The models here were painted by Richard Kerr. Buildings in Ogre do not generally have point costs, except as determined by the scenario. 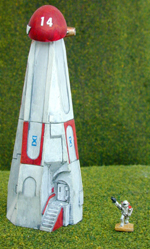 Laser weapons are the obvious exception; the Tower costs 18 points, and the Turret 12. Small structures, such as the Command Post and the Hardened Command Post, can be treated as normal units which cannot move or fire. A structure with 0 defense factor is destroyed automatically when hit, even if only by AP weapons. Larger structures do not have a defense factor . . . instead, they have Structure Points (SP). Such buildings are automatically hit whenever targeted, with any weapon removing twice the weapon's normal attack strength in SPs (except AP guns, which have no effect). Attacks during overruns remove 4 times the normal attack strength of the weapon, but firing units may only attack twice per overrun combat. The much-abused infantry are perhaps the best installation defense unit available. Surround the structure with two squads per hex (or two squads every two to three inches), taking advantage of defensive terrain if possible. If your resources are limited, place them in the most likely path between the building and the attacking force. To get within range, an attacker is forced to enter overrun combat with the infantry, which plays to the infantry's strengths. An alternate form of this screen replaces some of the infantry with slow-moving, but long-range units. Mobile howitzers are perfect for this role, if you can spare the points. The more common missile tanks will also work, but might be better used as a mobile screen between two structures. The source for all things Ogre starts at the main Ogre Page. Warehouse 23 has individual Ogre miniatures, boxed sets, and the original Ogre/G.E.V. board game. The Ogre Mk IV page has scenarios and pictures of the fastest cybertank. The Ogre Book is chocked full of scenarios, strategy, and commentary. For an analysis of laser weapons (and Shockwave in general), Philip Rennert's excellent article "Riding the Shockwave" is online. Laser weapons were first introduced in Shockwave, the supplement for the Ogre/G.E.V. board game. The Command Post is the standard roof over the Combine's front-line brains – the human brains, anyway. This is the basic headquarters for any major operation, and as such is the primary target in a wide array of scenarios. 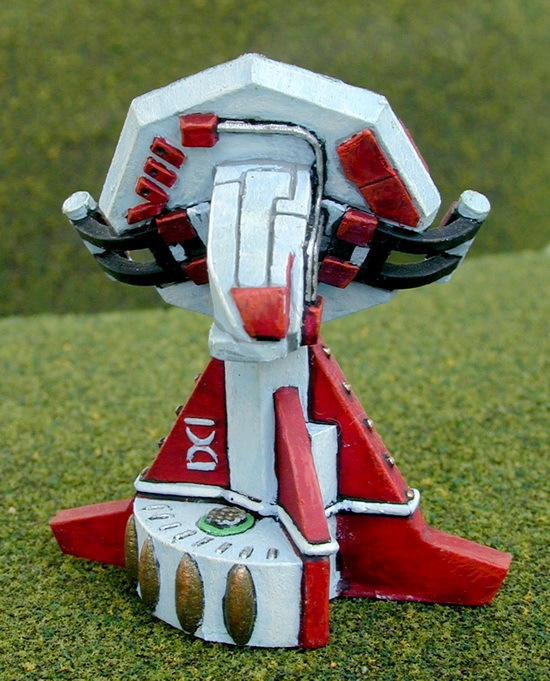 This figure stands 15mm tall, 44mm long, and 25mm wide. In an area which has not yet been secured, Hardened Command Posts (HCP) may be used instead. This design incorporates BPC armor; the amount depends on the scenario. The point value of the HCP depends on the scenario and its defense strength. It can have defense from 1 to 6. In general, raising the Defense of the HCP by 1 is worth 3 additional points. Even tougher versions are possible. Switching from standard Defense to Structure Points will allow even more durable buildings. Adding Point Defense (at 3 additional points per +1 Defense) to an HCP creates a very tough target, with both Structure Points and Defense. 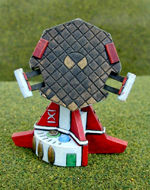 This figure stands 31mm tall. 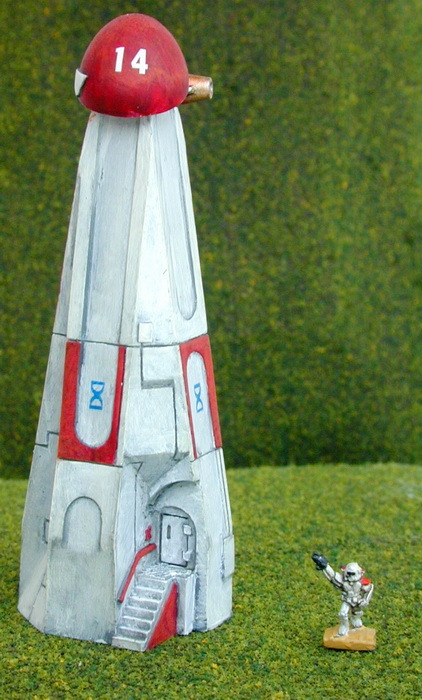 The footprint of the base is 32mm square. Laser weapons are the ultimate in anti-missile technology. 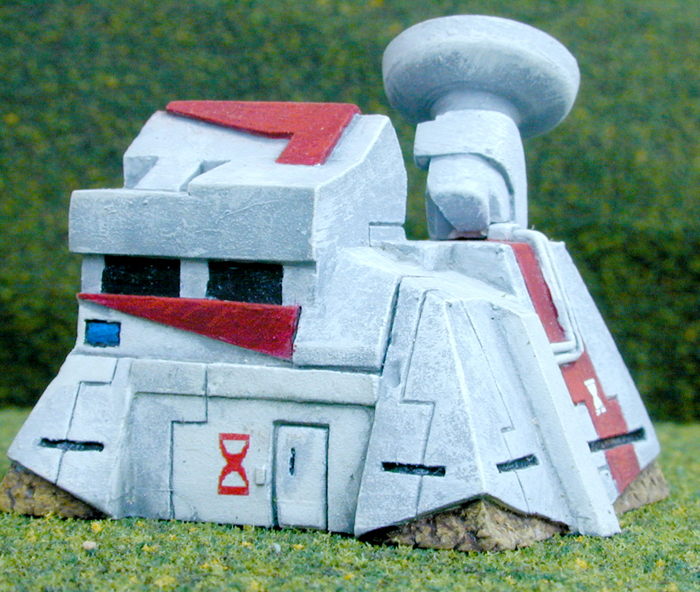 The Laser Turret is the basic version. Laser weapons use special "laser line-of-sight" rules for targeting. Its line of fire is blocked by any "raised" terrain. Towns and forest are examples of raised terrain. 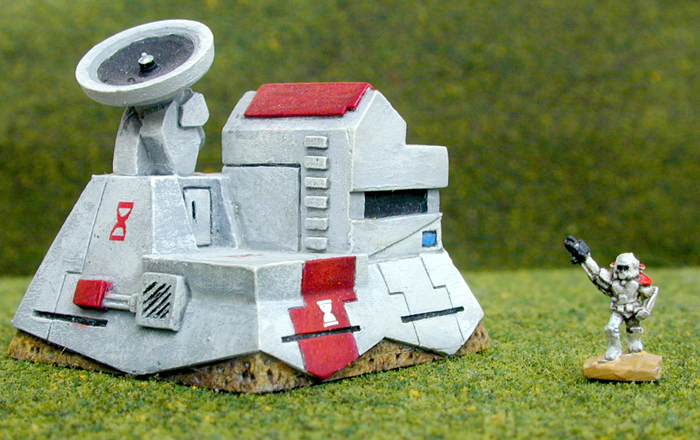 Units within (or over, for missiles) such terrain are also protected from laser turret attacks. 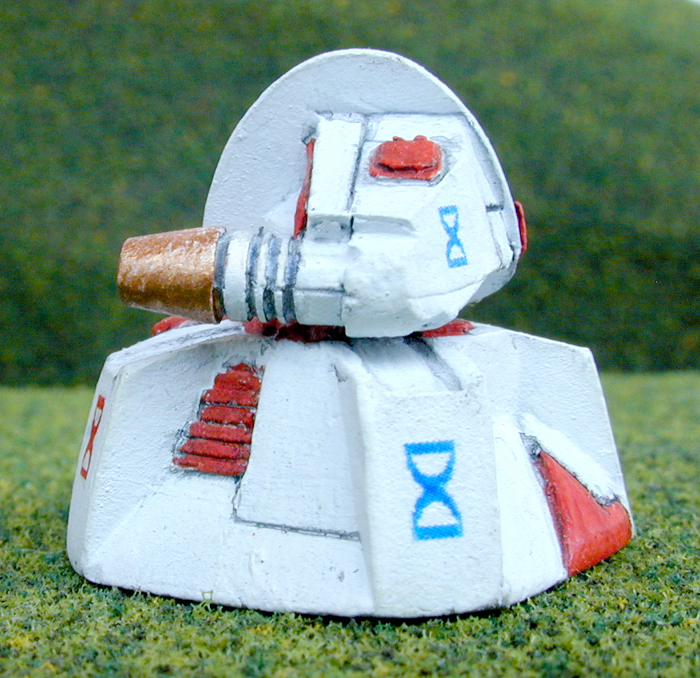 Laser weapons can shoot down cruise and Ogre missiles, on the opponent's turn, with a roll of 9 or better on two dice. However, a laser which does so may not attack on its next turn. The primary role of a laser weapon is as an anti-missile unit. To counter cruise missiles or an Ogre with a missile rack, no unit works better. However, without missile targets, the laser turret can still perform the duties of a howitzer, using its incredible range (30 hexes/60") to compensate for its weak attack strength of 2. Also, laser turrets are more durable than howitzers due to having 30 SP rather than Defense – although the turret cannot fire when the total SPs have been reduced to 10, it does not count as destroyed until all SPs have been removed. This figure stands 22mm tall. The base has a footprint 22mm square. The Laser Tower is the tallest of the Combine's military structures. It follows the same rules as the Laser Turret, but trades some durability (20 SP total) for double the range. 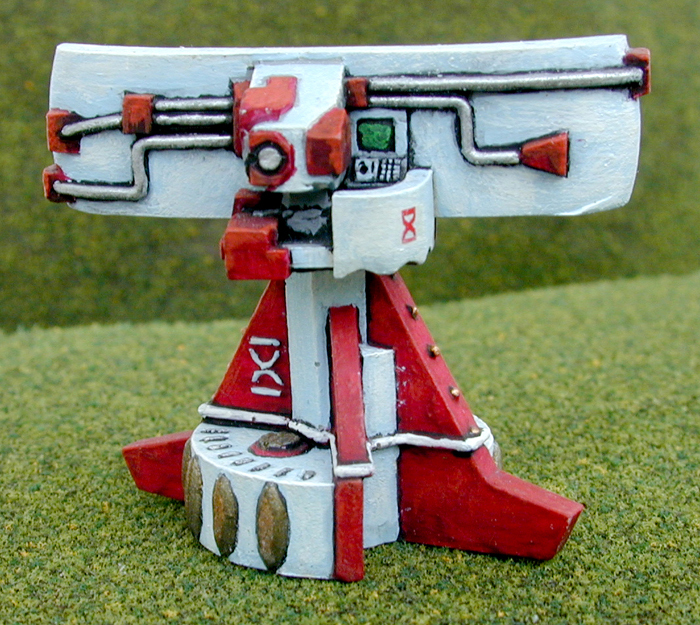 Due to its height, the Laser Tower can fire over any type of terrain, as well as attack any missile. Units on the ground within raised terrain still cannot be targeted. This figure stands 76mm tall. The base has a footprint of 26mm square. Radars are used for both communication and detection. 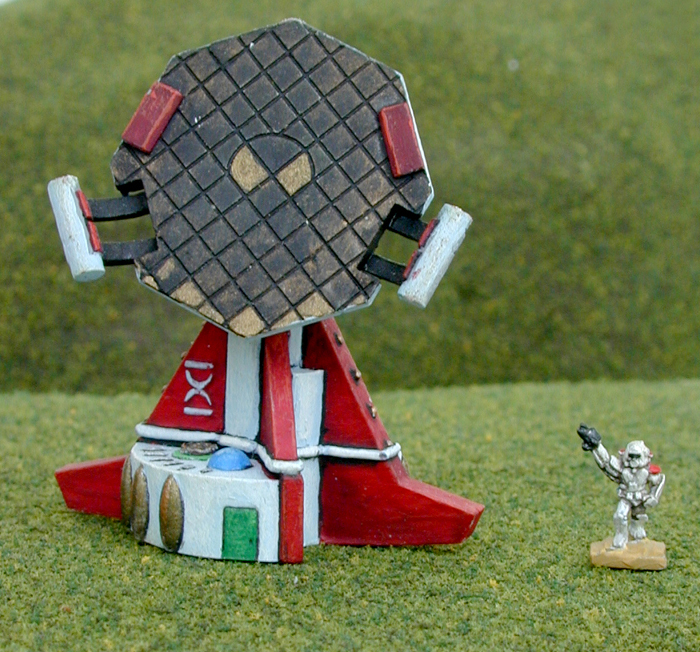 Normally, a radar structure is merely a target in a scenario, but it can also function as an optional army enhancer. Radars normally have 10 SPs. For 10% of the total force point total, a Sensor Net can be installed. This grants a +1 to all attack rolls for friendly units within 30 hexes/60". Both the friendly unit and the target of the attack must be within the radar's range. These effects are lost when the last radar is destroyed, or the unit leaves the Sensor Net area. Additional radars may be purchased for 5 points each. This figure stands 34mm tall. The base is 30mm at its widest. Jammers, or jamscreens, emit a wide variety of signals which spoof every detector a cruise missile can use to orient itself. Any cruise missile which moves within 15 hexes/30" of the jammer immediately loses control. It moves a random distance (1d+2 hexes or 3d inches) in a random direction (spin a pencil), then crash-lands. On a roll of 4 or greater on one die, the missile explodes; otherwise it harmlessly self-destructs. Jammers have 20 SPs, but no longer function once they has been reduced to 10 SPs. They are not counted as "destroyed" for VPs until the building is reduced to 0 SPs. These optional rules are currently being playtested, so their balance may need a bit of tweaking. If you use these rules, and encounter a problem, have a question, or just want to make a suggestion, email us. These optional rules replace the official rules (above) concerning the effect of the jammer. Each option represents a different type of jammer. Each type must be purchased separately, and be represented separately; one structure cannot operate more than one jammer. Players should note which type of jammer they have purchased. Opponents should not know which type of jammer they are facing until they are effected. If multiple jammers have been purchased, the specific location of each type should also be noted, to prevent unsportsmanlike conduct. 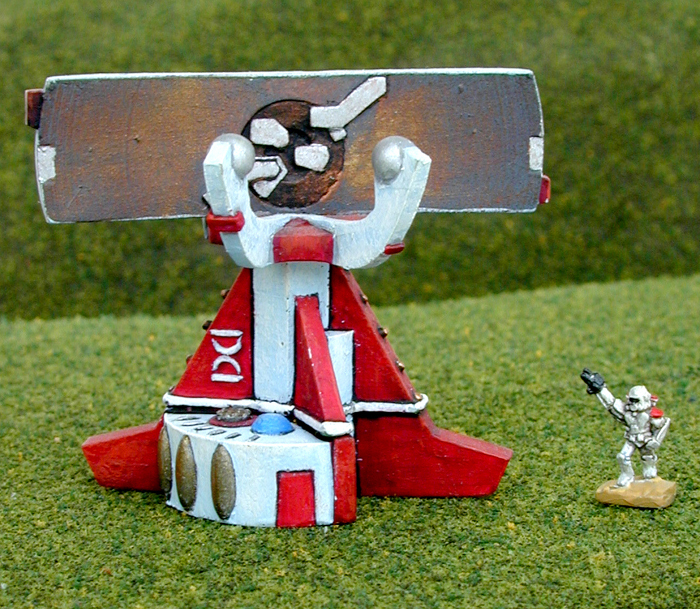 Alternatively, cardboard chits may be placed next to the figure, indicating its type. If your group is willing to handle the extra complexity of written orders, the different types of jammers may be combined into one structure. At the beginning of each round, the owner of each jammer writes which modes are active during that round, and for which jammer (chits would be useful in this situation as well). When a unit enters into the area of effect, the mode for that jammer is revealed. Some modes, like the Pulse, will still require a firing action on the owner's Fire Phase. Modes can only be changed at the beginning of the round. Ordinarily, only one mode may be activated at one time. For double the normal cost of all the modes available, more than one mode may be active during one round. Jammers with this capability will be very expensive, and very large targets. Jammers effect friend and foe equally; your own units aren't immune to the jamming, so plan accordingly. Jammer effects operate continuously as long as they are active. The one exception is the Pulse Jammer (see that entry). Jammers come in a variety of types, depending on which frequencies they interfere with, and at what strength. Each type of jammer must be purchased separately. Overlapping jammers of the same type do not have a cumulative effect. However, an area can be under the effect of multiple jammers. For 6VP, this jammer may disrupt any missile (cruise or Ogre) within 15 hexes/30". Any units which attempt to intercept a disrupted missile add 2 to their roll. For 3VP, this jammer can reduce the attack strength of any Ogre missile by 1, if either the firer or the target are within a 15 hex/30" radius. For 6VP, this jammer can chose to direct its effects narrowly, into a cone 10 hexes/20" long and 11 hexes/22" wide at the widest point. All units within the area of effect subtract 1 from their attack strength, for as long as they are within the area of effect. Units with adjusted attack strengths of 0 or less cannot attack, but can defend normally. Ogres subtract 1 from the attack strength of each weapon. Infantry are unaffected. For 12VP, this jammer can tune its effects into a weapon. It focuses a blast of disrupting signals at a spot within 5 hexes/10". Each unit within this hex or the six surrounding hexes (or, for hexless games, within 4" of the targeted point) are considered disabled on a roll of 4 or greater on one die. Ogres and infantry are unaffected. Units disabled by a jamming pulse recover normally. Units which are already disabled, and fail the roll, are considered destroyed – their electronics are useless for the duration of the battle! Units which enter the area at a later time are not affected. For 12VP, this jammer can prevent any unit within a 15 hex/30" radius from combining its fire with any other unit. Infantry may still combine into platoons. Ogres may still combine the fire on any of its own weapons. Units within the effective radius of this jammer lose all advantages from Sensor Grids and Command Posts. For 18VP, this jammer can destroy any Cruise Missiles within a 15 hex/30" radius. Any affected CM travels for (1d+2 hexes / 3d inches) in a random direction, then crashes, with a 50% chance of exploding on impact. This figure stands 45mm tall. The base is 30mm wide.